1 A None No Power Seat 1 A has some extra legroom due to the exit row. This seat is somewhat quieter as it is at the very front of the aircraft, ahead of the engines. Passengers seated here will be the last to disembark as the main door is located at the rear of the aircraft. 1 B None No Power Seat 1 B has some extra legroom due to the exit row. This seat is somewhat quieter as it is at the very front of the aircraft, ahead of the engines. Passengers seated here will be the last to disembark as the main door is located at the rear of the aircraft. 1 C None No Power Seat 1 C has some extra legroom due to the exit row. This seat is somewhat quieter as it is at the very front of the aircraft, ahead of the engines. Passengers seated here will be the last to disembark as the main door is located at the rear of the aircraft. 1 D None No Power Seat 1 D has some extra legroom due to the exit row. This seat is somewhat quieter as it is at the very front of the aircraft, ahead of the engines. Passengers seated here will be the last to disembark as the main door is located at the rear of the aircraft. 17 A None No Power Seat 17 A is a standard Economy Class seat although proximity to the lavatory may be bothersome. This row will experience more bumping and passenger traffic, especially during boarding, as the main entry door is immediately behind this row. Passengers seated here will also be the last to be served. 17 B None No Power Seat 17 B is a standard Economy Class seat although proximity to the lavatory may be bothersome. This row will experience more bumping and passenger traffic, especially during boarding, as the main entry door is immediately behind this row. Passengers seated here will also be the last to be served. 17 C None No Power Seat 17 C is a standard Economy Class seat although proximity to the lavatory may be bothersome. This row will experience more bumping and passenger traffic, especially during boarding, as the main entry door is immediately behind this row. Passengers seated here will also be the last to be served. 17 D None No Power Seat 17 D is a standard Economy Class seat although proximity to the lavatory may be bothersome. This row will experience more bumping and passenger traffic, especially during boarding, as the main entry door is immediately behind this row. Passengers seated here will also be the last to be served. Tea, coffee, water and biscuits are offered throughout the day. Air New Zealand uses this aircraft on short-haul domestic flights within New Zealand. There is limited inflight service and amenities aboard this small, turboprop aircraft. Row 17 is fast to board and disembark Cannot recline this row Limited or no overhead storage as it is used for flight attendants and equipment Would recommend row 16A or D.
Air New Zealand appear to be operating two different models of ATR - older models have much less leg room in Row 1 than more recent acquisitions reducing the quality of the description as Good Seat. Discovered this on my return flight in same row and could stretch out comfortably. I found the the ATR72 to be much quieter than the Q300, and the seats comfortable enough for a NSN-AKL flight lasting just over an hour. For a short flight, these seats tick the right boxes, in terms of comfort. Although legroom wasn't fantastic, it provided with basic comforts for an hour flight. I was disappointed to find my stow-away table was slightly broken. It was good that it still reclined; slightly. It was a great flight. Did not need to have much leg room and recline because these planes only do 1 and a half hour flights max so nothing to really worry about. I've been on this plane a couple of times and each one was horrible for me (I'm prone to motion sickness). Landing in Wellington is very rough because of the strong winds so it's just worse in this small plane. I would suggest bringing along a small pillow if the turbulance bothers you because resting your head on the wall is very much like leaning in a jackhammer. On top of that it's noisy as expected so you'll probably only sleep if you're exhausted. I feel it is worth paying extra just to avoid flights on this plane. Flights are longer. The exit is always at the rear for AIRNZ, so row 16 and 17 is much better for quick exit. the back row seats may have more bumping, but due to the predominantly short haul nature of these flights, being immediately be the door means an exceptionally quick escape from the plane, especially if you have no checked baggage. However, if I can't sit at the back, I prefer to sit forward of the propellors, because it is quieter. I (unfortunately) fly on these a lot. 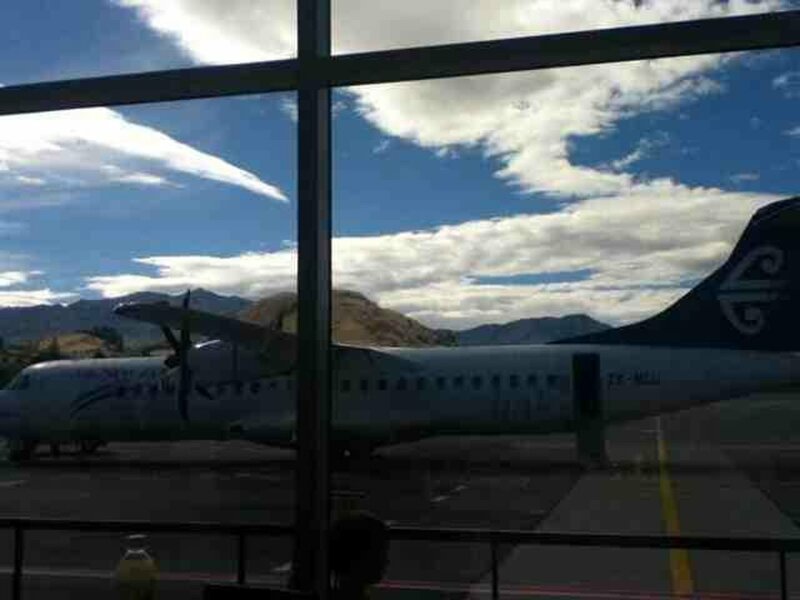 Air New Zealand flies 1 versions of ATR 72.